Today I’m thrilled to have Ben Beck on the show. Ben is someone who I met randomly during lunch at Social Media Marketing World. I sat down at a table and Ben started talking about chatbots which is something that I’m really into right now. You’re listening to the My Wife Quit Her Job Podcast, the place where I bring on successful bootstrapped business owners and delve deeply into what strategies are working and what strategies are not in business. 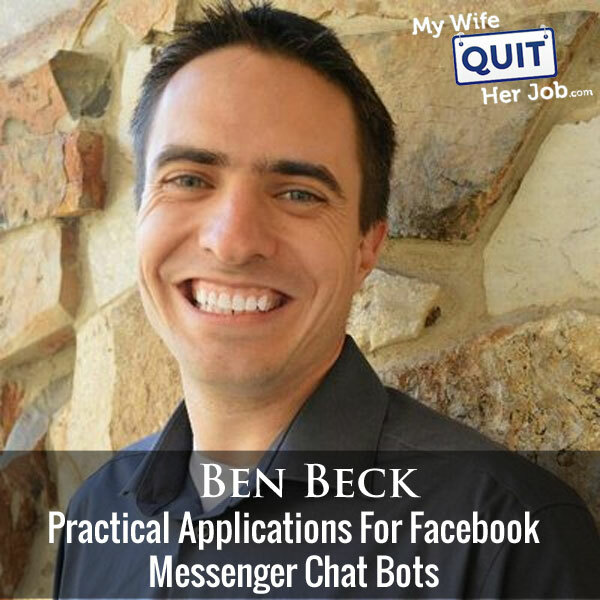 And today I’ve Ben Beck with me on the show, and Ben is someone who I met at Social Media Marketing World and he’s a marketing consultant that specializes in chat bots. Ever since I decided to go all out on Facebook Messenger, I wanted to have Ben on to talk about the many different applications for chat bots that he’s been seeing from a wide range of industries. But before we begin, I want to give a quick shout out to Klaviyo who is a sponsor of the show. Always excited to talk about Klaviyo because they are the email marketing platform that I use for my ecommerce store, and I depend on them for over 30% of my revenues. Now Klaviyo is the only email platform out there that is specifically built for ecommerce stores, and here is why it is so powerful. Klaviyo can track every single customer who has shopped in your store and exactly what they bought. So let’s say I want to send out an email to everyone who purchased a red handkerchief in the last week, easy. Let’s say I want to set up a special auto-responder sequence to my customers depending on what they bought, piece of cake, and there is full revenue tracking on every single email sent. Now Klaviyo is the most powerful email platform that I’ve ever used and you could try them for free at mywifequitherjob.com/K-L-A-V-I-Y-O. Once again, that’s mywifequitherjob.com/K-L-A-V-I-Y-O. I also want to give a shout out to Privy who is also a sponsor of the show. And Privy is the tool that I use to build my email list for both my blog and my online store. Now there are a bunch of companies out there that will manage your email capture forms but I like Privy because they specialize in e-commerce. And right now I’m using Privy to display a cool wheel of fortune pop-up. Basically a user gives their email for a chance to win valuable prices in our store and customers love the gamification aspect of this. And when I implemented this form email signups increased by 131%. Bottom line, Privy allows me to turn visitors into email subscribers, which I then feed to my email provider to close the sale. So head on over to Privy.com/Steve and try it for free. And if you decide you need some of the more advanced features, use coupon code MWQHJ for 15% off. Once again, that’s P-R-I-V-Y.com/Steve. Now onto the show. Steve: Welcome to the My Wife Quit her Job Podcast. Today I’m thrilled to have Ben Beck on the show. Now Ben is actually someone who I met completely randomly at lunch at Social Media Marketing World. I basically sat down at a table and Ben just started talking about chat bots which happened to be something that I’m really into right now. I discovered that he was a speaker and then decided to have him on the podcast. Now Ben is an entrepreneur, a marketing consultant and the author of the weekly monthly column on the Clear Voice blog. And today what we’re going to do is we’re going to talk about applications of chat bots in businesses of all kinds. And with that, welcome to show Ben, how you doing today man? Ben: I’m doing so great, thank you Steve for having me on the show. I feel like it’s an honor because I listened to your podcast that you got a few weeks ago, where you’re talking about the technology that you used to run your business and it was fascinating. I’ve always loved marketing technology, and to hear how someone like yourself has used it to build a publishing business, it was just fascinating. So thank you for having me on your show. Steve: Yeah, man. I’m just so happy that I went to Social Media Marketing World. I just met so many people just kind of randomly in the hallways too and you just happen to be one of those people. Steve: So we did chat a lot about bots that day, but I actually don’t really know your entire background. Like how did you get into this field in the first place? Ben: Yeah, so my undergrad degree was Business Information Systems and so the more technical side of business. And then I started my career actually as a web developer, so doing PHP code, building a website. That was before WordPress was big, so it was a custom built CMS that we had. And that technical side, I really enjoyed it but the company that I was at had a need for someone to apply that in the marketing sense. And so I started to apply it in marketing. And it’s blossomed from there where for three or four years after leaving that company I was working on marketing automation really heavily. And then marketing automation the last year and a half, two years has really blossomed into chat bots. And so while I’ve been working for companies, I’ve also been doing a lot of side consulting and it’s given me experience with all these different marketing automation tools. And now getting into the chat bot space I’ve played with all of the big chat bot builders. Yeah, I love it. It’s just so cool to get to try new things and be learning and helping clients grow as I also grow in my own experience. Steve: So just to be clear, like when you’re talking about chat bots, are you referring to messenger or are you referring to like text messaging and some of the other chat applications as well. Ben: So I have only launched on Facebook Messenger, even though I’ve done some consulting for a client. They launched a text messaging campaign, and their whole business is around getting reviews, mostly for auto dealers. But they are a big review aggregator and they’re using chat bots instead of text messaging to do that, and they are growing hand over fist. They’re here and Utah with me, and this company is they are exploding in their growth because of their leveraging chat bots. Steve: It’s interesting you mentioned like you’ve used all these different tools. What are some of your favorite tools just to kind of start it off right off the bat? Ben: So my top four faves are ManyChat, that’s if anyone who’s done research on chat bots who’ve been around there, ManyChat is getting the most press right now. So ManyChat is the big one. Another one is Chatfuel. I like Chatfuel just because its ease of use is really good if I have a client who wants to build their own bot and they just want me to kind of teach them how to do it. A lot of times I push them to Chatfuel. And then the two other ones — so one used to be called API.AI, it recently well within the last several months was rebranded as Dialogueflow, and that’s Google’s product. They acquired API.AI and they’ve got a very robust tool. Their tool is robust because you can build your chat bot once and release it in multiple places. And one of the really cool places you can you can release your chat box, so you can build the logic for a chat bot that would work on Facebook Messenger. And then you can take that same logic and roll over to an Alexa skill and actually lets you export the Alexa skill that you can then put on that you can then import over to Amazon’s developer tools. So, really cool stuff that I had I geek out on Dialogueflow, even though it is it is hard to use, you kind of need to be a developer. Steve: It’s a Google product. So naturally, you probably need to know how to code right bit, right? You know, I actually jumped ahead a bit about myself — I jumped ahead a little bit in terms of chat bots. Let’s talk about what it is first, just in case there’s people listening out there that have no idea what is. And then I want to talk about some of the practical applications that you’re seeing some of the companies that you’ve worked with, and how they’re using these bots right now. Ben: Great. So yeah, taking a step back to even I tell people I work on chat bots and their eyes kind of glaze over and they say, oh, really? Okay. Well, what’s that? Most of your listeners have probably used Facebook messenger to communicate with their loved ones, and a chat bot is when you interact with a business. And this can be from their Facebook page, there’s that blue button that hovers over the right sidebar on a Facebook page and you can click it. You just send a message. Steve: What do they do if someone asked a question that isn’t part of the database? Ben: Yeah, if they ask a question that isn’t part of the database and that happens frequently, the automated response says, I’m sorry, I don’t understand that but would you like to talk to a human. And there is a button they click, and they click that button and it actually places a phone call from their phone. Steve: Ah, interesting. How is that implemented to place the phone call? Is it just built into these tools? Ben: Yeah, all of the — I think all of the tools, the four tools out there, the ones I had started discussing, so Dialogueflow, Flow XO, ManyChat and Chatfuel, all of them have that natively built in where it’s just an option. You say, hey, here’s the button. If they click it, dial this phone number. Steve: Awesome, awesome. So, the idea here I guess is the chat bot replaces or tries to handle the most frequently asked questions for business so that it reduces their support load in a way. Ben: Exactly, it reduces their support load and it gives them some interesting insight. So, this company, they use Google Analytics and they watch Google Analytics pretty closely to see which pages are being visited, which search queries when they can see that are leading people to their website. And they watch all that data relatively closely to try to determine, hey, where do we need to improve our business? And the chat bot opens that up for them because now people that might have been reticent to reach out because they don’t want to wait forever for someone to chat bot chat back, or they don’t want have to call in and talk to somebody, now they’re getting people that are reaching out to them through an automated means and they’re getting that feedback. They’re seeing what kind of questions people are asking, and they’re using that to actually develop content for their website. If someone asks a question to the chat box that they don’t understand, and they’re seeing that coming up multiple times, then they’ll go in and they’ll program that into the chat bot. Steve: Interesting, so does that imply then that you need someone human to just kind of man this thing? Ben: You do. There is a — I have a golf company Teesnap. They provide software as a service for golf companies to help manage the courses. They’re really innovative. Just last week, I helped them launch a birthday club chat bot. And the birthday club is it’s a really simple bot simply asking for birth date and then it helps fulfill the birthday club promise in the chat box. So on their birthday month, people get an offer to go out and get a free round of golf. And it’s a completely automated process, but there’s still a human interaction there. The marketing director for Teesnap, super responsive, he jumps into ManyChat every single day and he just watches the conversations. And you can within ManyChat actually interact right there in a live chat module with the people that are trying to converse with your bot. So you can have those conversations right there inside ManyChat as well. Steve: Interesting. Okay. And then what are some of your other companies specifically in like the e-commerce space, I don’t know if you have any clients selling physical products, or even like brick and mortar stores, what are some ways that some of these businesses are actually getting new clients as opposed to just doing customer support with the bot? Ben: Yeah, so one of my clients, they’re in Provo, Utah. They are in a high end strip mall, they’re brick and mortar, but they also do online Blickenstaff’s. It’s a toy store. They are quite excited about Toys R Us going under just because it’s going to lead to extra business for them. And they’re a really innovative store where they — it’s more about an experience. Trying to compete with Amazon, you have to compete on price, but you also need to make it a really neat experience. Ben: Yeah, that’s available on same day. But what my wife and I usually do is we’ll just run to a local store, and pick up a toy, and then it’s kind of a chintzy toy. It’s not really creative. There’s not as many options, but this toy store, what they’re doing to compete is we’re building a chat bot right now. And it’s not completely baked out because they’re being really strict on what products they put into the bot. But it is a bot where the mother can say, I’ve — it kind of demographically profiles the child. So it asks for the gender, it asks for the age and asks for interests. And then it returns some ideas for products. And the mother can click buy right then right there inside the chat bot, and it will pull up, it’ll do a little slide up in the bottom of Facebook Messenger where they punch in their credit card info. And as soon as they place the order, it actually takes the order and drops it into a Google spreadsheet that the store is using and we could put it into their point of sale, but they chose to use a Google spreadsheet because that’s kind of a communication means they’re using inside their store already. It adds a line to Google spreadsheets and it turns on a Philips Hue light bulb right there by their front desk so that they know there’s an order they need to go check on. And they go and check the order, they fulfill it and the mom comes by within 15 minutes and has a pre wrapped gift ready to go. Steve: Interesting. Okay so both Chatfuel — Chatfuel has this option to take payment directly through messenger and I think that’s coming to ManyChat pretty soon I believe, right? Ben: Yeah Chatfuel has, and ManyChat when you and I were talking Steve at Social Media Marketing World, I mentioned that they didn’t have it yet. They released it like two days before the conference, so I was actually wrong when we were talking. ManyChat does have it now. Ben: It’s still in beta, it’s only in some accounts, I don’t think all accounts have it yet. But it’s a little bit more limited than Chatfuel too. Chatfuel uses the native Facebook credit card processing. So if someone has ever purchased anything through Facebook Messenger, their credit card details are stored there, and that’s using the native engine that Facebook provides. ManyChat uses Stripe or PayPal and so it’s not native. The people I believe have to enter their credit card every single time they purchase something if you use ManyChat’s. Steve: I see. So for this toy store, how are they actually getting people to engage with the chat though? Ben: So they’re advertising heavily. The nice thing as you know with Facebook advertising is you can draw a fence around your store because they are trying to capture brick and mortar here. They’ve drawn a 10 fence around their store and then choose the demographic that they think likely have children, and then they’re advertising in that way. Steve: Interesting. Can you give us an idea of what these ads look like? Ben: Yeah, so the ads have birthday type image and the calls to action are all around have a birthday party coming up, use our app. Ben: They are getting a lot of clicks where people click it and it takes them straight into the chat bot. Steve: I see, where then they enter in their parameters, and then they get gift recommendations. Steve: So it’s actually providing a useful service like even just for researching a toy, period. Ben: It is. And it’s something that they haven’t started to promote it in this way. But the thought is, if it goes well with brick and mortar, they’ll expand this, and they’ll use it for online ordering. And then you don’t get the immediacy that you — the benefit that you do from the brick and mortar, but they can ship stuff out from their online inventory to people that have used their gift idea outside of the Utah area. Steve: Interesting, interesting. And so once they get a customer this way, they have a messenger subscriber, what are they doing with these subscribers like outside of these ads? Ben: Nothing yet, and it’s a matter of, we just haven’t built it. The plan is though; you can broadcast messages out to the people or your subscribers. Once someone has engaged with your bot, you can send them broadcasts. The Facebook rules say that you can only send a salesy or a heavily marketing promotional type message within 24 hours that someone has engaged with you, but if it’s a value added offer, and you’re not really being salesy, then you can send those out as frequently as you want. And so the thought will be, hey, let’s send birthday guides, or let’s send toy guides, or let’s just send us an announcement about a new toy that they have in the store and it’s got a video of someone using that toy. You’re not selling it, you’re simply showcasing a tool or a toy, and then if someone wants to, they could go on and buy it from there. Steve: I just want to take a moment to thank Pickfu for being a sponsor of the show. If you currently sell on Amazon like I do, then you know how crucial the quality of your Amazon listing is to the success of your e-commerce business. So for example, I’ve run experiments on my Amazon listings, well simply replacing the main image with a different photo resulted in a 2x increase in conversions. But how do you choose the best and highest converting photos for your listings? How do you know that you’re using the most profitable images for your products? And how do you know that your bullet points are convincing. This is where Pickfu comes in. Pickfu allows you to solicit real human feedback about your Amazon listings in 10 minutes or less. And you can target the exact demographic of your end customer. So for example, let’s say you sell napkins and you have two main product images that you want to test. You would simply go to Pickfu, list the images, target female Amazon Prime members over the age of 35 and hit go. Within 10 minutes you’ll get feedback of which image people are more likely to buy along with specific feedback on why they made the decision. So I can imagine that implementing some of these chat bots can be kind of spammy. So what are some rules of thumb that you kind of use when implementing these chat bots so that they’re done tastefully without annoying a potential customer? Ben: Absolutely. It’s a great question. So it’s still a wild wild west where like within ManyChat. If someone replies with stop, it will unsubscribe them from the bot and they won’t receive broadcasts from you anymore. But the way that Facebook has gone about it is that stop parameter, the unsubscribe isn’t handled on Facebook side, it’s actually handled inside of ManyChat. So, if someone wants to, they can go in and they can open up the program with that unsubscribe handling and they can just delete it and then it doesn’t work anymore. And then Facebook’s privacy/ spam policy is kind of kind of broken. So, in that regards, there is a lot of room for spamming. And that’s why I always tell marketers, hey, be above board with this. We don’t want this to become like email, where you’re getting tons of messages all day. It needs to be something that’s truly above board. Just a couple of key points I always tell clients, always specify that it’s a chat bot. You might want to try to make it seem like it’s a human and you’re just ultra responsive and you have really good customer service, but unless you have millions of dollars to spend on developing artificial intelligence and natural language processing around your chat bot, it’s going to fall short and you’re going to have egg on your face. So, always specify that it is a chat bot. Steve: Like in the first line you mean, like this is our automated bot. Ben: Yep. And I actually I’ll have them do it a couple times. So, you have your greeting text that when someone first like clicks the little blue button on Facebook Messenger, or if they search for your bot inside a Facebook Messenger, or if they, I guess those are the two scenarios, if they see — if their first interaction is through one of those scenarios, there’s some greeting text that shows up and you’re supposed to state the purpose of the bot. I always specify there that it is a chat bot. And the second thing that I specify is what the purpose of the chat bot is. So, for this golf company, we specify very clearly that it is a bot for the birthday club. Steve: Do you use the word bot? Steve: Interesting okay. I’ve actually had some issues with that on my store as well. Like I start out saying that you can ask a question, check up on an order, basically our frequently asked questions, and then I guess there must be some misunderstanding because sometimes people just start typing like these really long involved questions. And that’s when I tell them that it’s a bot. Like, we don’t understand this question. Would you like to talk to a human. Yeah, I never thought about just stating that right from the start. Does that change the behavior of their questions though? Ben: It would and you might actually benefit the way that you’re doing where you’re getting a longer comment on Messenger, they think they’re talking to a human. You’re gathering extra intelligence that you could use for business process optimization. But I still like the idea of making it clear up front that it’s a bot just because I know you’re setting expectations up front which to me it seems like it’s always a good thing to do. Steve: Okay. And so you always offer the ability to unsubscribe. Do you do that for every single broadcast, every single message or is it just something you just say once right from the start and then that’s it? Ben: Yeah, I just say at once from the start. I don’t know that I would want to say it with every single broadcast even though what I have done for some of my clients where they’re more sensitive and they really want to make sure that they’re above board and not getting in trouble for spam is they program in other things too. So, the two keywords that ManyChat and Chatfuel on most of these platforms use out of the box is stop or unsubscribe. And so we program in other things like anymore, I mean, just little phrases that might come up if someone doesn’t want that conversation anymore, they program those in as well. Ben: Yeah, so one of the best examples out there and I recommend all of your listeners to go and look at his course. Andrew Warner if you search him, he has I think he calls it the Bot Academy. Steve: Isn’t that more for teaching people how to become a services business related to chat bots? Ben: it is, it is, but it’s a really good example even if you just — you don’t need to pay for his course and sign up for it, but go in and sign up, just interact with his bot, and then you will get messaged like crazy. I think his bot is perhaps a little bit too pervasive along the lines of annoying, but you’ll see some ways that he’s delivering content. He’s got videos, he’s pushing out, he has little PDF guides that people can download that he’s pushing out, he’s got lots of content, and he’s not even requiring that you give him your email, he asks for it. But you don’t have to give him your email because he knows he can still communicate through the bot to you and he can drip this content. He sets it up, it’s all automated, and he’s seeing really, really good success rates with it where I would be surprised if he’s not making a few million a year off of his course with how pervasive he is in the marketing. Steve: Yeah, I’ll have to link that up in the show notes. I remember the question I wanted to ask you now. What is Facebook doing right now to just kind of enforce these non sponsored broadcasts? Have you seen people get banned? What are the thresholds involved? Like, what are people doing? Like I’ve gotten actually promotional messages in my chat and I’m like, hey, how did people get away with this. What have you seen in terms of people getting banned or punished for this? Ben: So Facebook, I have not heard of any stories of them banning or punishing anyone yet. So, in that regard, I think it’s still so new that you don’t have a lot of bad players in the space. Facebook is quite good at the 24 one rule. I know with ManyChat at least. So, it’s called 24 plus 124, we already mentioned, you can send a promotional message within 24 hours of interacting with the person. And then the plus one just means that you have a onetime exception to that. So if you have 3,000 people in your database, and let’s say 1,000 of them, you have tagged as being a really strong prospect for purchasing your course or your information product, you can you can tell ManyChat, I want to message all of these people, these 1,000 people that I’ve identified. And even if I haven’t interacted with them in last 24 hours, I want to use that plus one. And so ManyChat and Facebook through their terms and agreements, they allow you to send one promotional message to that audience. But ManyChat tracks it if you’ve used that plus one for those thousand people, they’re not going to be reachable anymore for promotional messages. It’s an honor system right now where ManyChat, you just check a box to say if it’s promotional or not. It’s that simple. And so because it’s the honor method, people could abuse it and I think we’re going to see Facebook is going to have to police that once the problem starts. I just think there’s not a big problem with it right now since it’s still so new. Steve: I see, I see but from the perspective of the end user, all these different message types, they’re all the same right, they’re just something you get in your messenger inbox? Ben: They are, they’re all the same from the perspective of the consumer even though there’s some really smart things you can do in ManyChat and I believe Chatfield has this too. You can say, hey, when I push a notification, you can do a couple things. You can make the phone make the little ding or the vibration every single time a message is sent, so like if you’re setting up a promotional string and it is has three different messages in that promotional string, their phone will ding three different times. Or you can say, I only want it to ding once for the first message, or you can say I don’t want to make any audible or vibration, I just want to show up in their notification tray. Or you can say I don’t even want it to show up in the notification tray, only show it when they log into Facebook Messenger, and then show it as the bold black text on unread message. So, you can choose the different ways that you are notifying your consumers and use that very responsibly. If you have something that’s not urgent, then don’t ping your customers every single time you send a message. So, just be systematic and thoughtful, and intentional in the way you do it. Steve: It just seems counterintuitive because you want them to see the message, right? And so it seems like most people will just check off all those things whenever they send something. Ben: Yeah. But then you’re also creating noise. Like if your audience — it’s kind of like an email. I mean, if you keep spamming people with unrelated emails or irrelevant emails to them, they’re going to stop listening to your brand. So, it’s in your best interest as a business owner to just be careful and only bring that notification if you need an immediate action. Otherwise, it might be okay if it just shows up in their notification tray with no audible notice. Steve: What do you do with your clients for broadcasts? Ben: If it’s something that’s timely, I will recommend that they do a single audible notification. Otherwise, if it’s not something timely, I’ll ask them to just have it just show up in the notification bar. I’ve had some clients before try out having no notification to have it just be in Facebook Messenger when they open the app, engagement rates are all still about the same. And it’s between 80 and 90% open rates on all these messages, despite the way that you notify them. Steve: I see. Okay, that’s what I was getting at. But it’s just a timing thing, like whether they open immediately or they get to it later, right? Steve: Okay. And I did want to — you mentioned four tools in the beginning. I kind of want to revisit that. What do you recommend? Like you mentioned ManyChat and you mentioned Chatfuel, and you mentioned API.AI, that was the tool? Ben: Yeah, now called Dialogueflow. Steve: Dialogueflow. So, when would you use each, under which circumstances? Ben: So, Dialogueflow, if you have some real budget, let’s say that you work for Keller Williams, the big real estate brokerage and you’re working for corporate and they have 50,000, $100,000 whatever it is to develop a chat bot, I would recommend you look at something like Dialogueflow, because Dialogueflow has more functionality. With ManyChat and Chatfuel, they’re both point and click interfaces. But because they’re point and click, you can’t use any of the real native API that’s available to you on Facebook Messenger, whereas Dialogueflow you can. You’re actually doing coding. They have some point and click elements, but to really get your chat bot working, you’re going to have to have some development skills. And because of that you get more power and more functionality and you get the natural language processing. The ability for someone to, let’s say Keller William’s example, let’s say someone sends a text message for a house and they put in the wrong address but it’s close, Dialogueflow could catch that and return the right product, the right home listing based on a slightly incorrect address. And they use natural language processing to do that. They’re the only one other than Microsoft has what they call Microsoft, they call it Bot Framework. They do the same thing. But Microsoft’s is not nearly as well integrated. I wouldn’t go with that one. Steve: So, when you say natural language processing, you’re implying a bot that’s actually intelligent, where you can actually make it appear as closely to human as possible compared to some of the other tools? Ben: Yeah, exactly. And so far Dialogueflow is the only one that’s doing that really well. Steve: Is it free then or? Ben: It is, it’s free. Knowing Google, they’re likely not going to ever charge for it simply because it’s giving their platform, their Google Assistant or their home products, the voice products; it’s giving that an extra platform and a way to get out there. They’re putting a lot of money into them. Steve: Okay so basically don’t use it unless you have technical skills or you have a developer, or you need something super advanced with your bot, right? Steve: Okay so, then Chatfuel and ManyChat, what are the differences there? Ben: The big difference is Chatfuel I would say is easier for really simple bots in large part because you login and they have a drop down tray at the top with templates, and you can simply select the template. It’s not a huge library of templates yet, but they do have some good starter templates and you select one and then you can go over and view how the template works and you can customize it. So, Chatfuel is easier for first time users. Steve: What do you consider a really simple bot? Steve: A really simple bot would be one that simply provides hours and directions for our brick and mortar location. Steve: Okay go it. And what would be a more complicated bot that you might want to use ManyChat for? Ben: ManyChat as if you get any kind of calculation in or like for example the Blickenstaff’s bot is built on ManyChat because you can use routing that’s a little more advanced. You can do it with Chatfuel too, but how Chatfuel works is it’s all a linear conversation like you will open up a message and you’ll edit a message. And then you’ll say, if they click this button, go over here to this message. And if they click this button, then go to this message instead. And you need to then click over and edit that message. And it’s really hard to keep it straight in your head with Chatfuel. Ben: When you get multiple threads, but ManyChat is very visual. It’s got like a dialogue; it’s got a canvas with the different messages on it. And then you click and drag arrows from one message to the next. And so when you get more complex, ManyChat becomes easier. Steve: I just wanted to take a moment to tell you about a brand new service that I personally just launched that will help you grow your email list for free. First off, my new business is called GoBrandWin.com. And it’s a service that helps e-commerce sellers build their email list through group giveaways. And here’s how it works. If you own your own e-commerce brand, and you have a following, what you do is you contribute a gift card toward your products valued at $200 or more. Now Go Brand Win will assemble gift cards from other participating brands with a similar customer demographic into one massive sweepstakes giveaway. Now, all participating brands will then send our co branded giveaway email to their entire customer base driving them to a special landing page on GoBrandWin.com where we will acquire email addresses and Facebook pixel data. We will also send the giveaway entry forms to related influencers in our blogger database. And between my co founder and I, we have access to almost 1,000 bloggers in our database. Now, consumers who enter the giveaway will enter their email addresses, we will send them special offers from your company and select a grand prize winner. And after the sweepstakes are over, you will receive the full list of entrants and instantly grow your audience. Bottom line, the concept is very simple. We all help each other promote each other’s businesses, get free promotion from bloggers, and share the spoils, which in this case, are the email addresses. If you are interested in growing your email list, then head on over to GoBrandWin.com, that’s G-O-B-R-A-N-D-W-I-N.com. It’s 100% free, so sign up now. Now back to the show. I see. So it sounds like it’s a user interface thing when it comes to developing the chat. It sounds like they have similar functionality. Just one has a better UI in terms of developing a more complicated chat flow. Ben: Yeah, functionality I would say they’re both on par with each other. They watch each other really closely in the development cycle. But yeah, it comes to the user interface. Steve: Okay. And so when you’re making a choice like for your clients since you’re doing the work like what does it come down to? Ben: Yeah I would say about 50% of the time I’m putting them on ManyChat. A lot of that is I can build the tool and then I can do a 15 minute screen record and send them a video showing them how they can edit it, and I’ll do that whole screen share from within the canvas view or I can just show them here this node goes over to this conversational node, that’s really easy. So 50% of the time it’s ManyChat, the other 50% of the time is split between the other three products just depending on complexity of the product. Steve: And you have any clients using the Google product Dialogueflow? Ben: I don’t, I’ve only played with that one. I have some development experience but only enough to be dangerous. Steve: Okay and what were the other — you said three other tools, what are the other two? Ben: One is Flow XO, and for anyone who attended the Social Media Marketing World Conference, if you went to their support page, they have frequently asked questions but they also had a link to the chat bot, and you could engage with the chat bot through that link. And it was all of their frequently asked questions that have been programmed into a chat bot. And the reason we use Flow XO is because even though Flow XO doesn’t have natural language processing, it does have a better system for catching a wide variety of queries. So, if someone let’s say if someone uses the word meal in their question, in ManyChat you would just show them the menu or show them, maybe you just show them the dining times or the location of the dining. But it’s kind of hard to differentiate between which of those responses you should show. And in Flow XO you’ve got some really sophisticated logic where you can say, if they use the word meal and they use the word gluten, then you know they’re asking about gluten free options and so return this message. Or you can say, if they use the word meal and they don’t use this word, then return this message. Ben: So like it’s better at handling keywords. Steve: Interesting, so but what are its limitations outside of that? Ben: The user interface is pretty clunky; it’s just not nearly as good as Chatfuel or ManyChat. And then functionality, it has some more sophisticated integrations. It was built as an integration platform originally, so it’s got some really good integrations, but if you’re trying to get a lot of new audience into your chat bot, ManyChat and Chatfuel will have some things called growth tools. And these would be like a little slide in that lives on your WordPress site and it slides in from the side, and it’s got a call to action, they can click the button and it will take them straight into your chat bot. ManyChat I think has around 15 of those different kinds of growth tools and Flow XO only has three or four. Steve: One thing I’ve been curious about is once you have subs on one of these platforms, can you move subs around to different platforms like email or no? Ben: Not easily. You’re asking about the — when you say subs, you’re talking about the programming language, like the actual logic that you’ve built around that? Steve: No, that’s what I mean. Like, let’s say I have 1,000 subscribers on ManyChat and I want to move over to Chatfuel later, like move those subs over, is that possible? Ben: It’s not, the subscribers live inside the individual platform database, and they don’t make them movable. Steve: Interesting. So, once you’ve chose — so it’s important to kind of choose the right platform from the start it seems. Steve: Yeah, you’ll probably lose some people yeah. Steve: Interesting. So this is different than email in that respect for sure. Steve: And was there a last tool that you didn’t mention, there’s two more, there’s Flow XO, and there’s one other? Ben: No Flow XO, there’s hundreds. Well, I’d say there’s probably 100 chat bot builders out there right now, but those four are the big ones. Steve: Okay. And then early on in the interview you mentioned some company that was using text messaging bots. Do you do that for your customers, and is there like a program that does that as well? Ben: So that was they actually built — I consulted on them just from an ideation phase. They took it and they built it out themselves. They connected directly through Twilio for their text messaging, and they’ve got their own code in the back end that’s running that whole chat bot. Steve: I see. I see. It seems like that would be right for abuse, right, because there’s no control whatsoever. There’s no one controlling a text message, right? Ben: Yeah, text messages are a little bit more intimate too than a Facebook Messenger stream, so I think yeah, you have to be really careful to not abuse that. Steve: Interesting, but there’s also no one to punish you either, right? Ben: There’s not. In the case that if you were using Twilio for your text messaging, they do have unsubscribe parameters built in where it’s the stop unsubscribe thing, and if you had a really high ratio of individuals responding with stop or unsubscribe, Twilio does black your account. They’ll black label you, because Twilio does need to be careful about their own servers that are sending the text messages and whatnot. Steve: Sure, sure, sure. It seems like text messaging is very similar to email like once someone has your number they can text you, whereas Facebook at least it’s gated right, where you have to opt in and there’s no way to message them with some sort of number or ID? Ben: That’s right and yeah and that’s some people, some of my clients have been hesitant to launch on Facebook Messenger because you’re really building your whole audience on someone else’s proprietary platform. And what happens when Facebook Messenger decides that, hey, we’re going to change our 24 plus one rule to 12 plus one, or hey you can’t outbound message them at all anymore unless you pay us the advertising, subtract the advertising dollars for that. I don’t see Facebook doing that, that would really kill the platform but as we all saw a few about a month ago, they changed what business posts show up in the Facebook stream, and it is affecting advertisers. Steve: Do you have any insights or predictions on what you think is going to happen in the next couple of years with the messenger platform? Ben: Mark Zuckerberg was end of 2017 in a quarterly earnings call. He indicated that it is one of their primary focuses, Facebook Messenger chat bots. And his quote was something along lines of we haven’t monetized it yet, but we will. And so, I could see Facebook continuing to put a lot of money into it. They already are, their developer stack if you want to tie straight into it is changing on a monthly basis where they’re introducing new functionality. So, they’re putting a lot of resources into their messenger chat bots. And I think they will for another three or four years. I think it’s going to be a really hot place for Facebook for their focus, and they’re going to start to monetize it, that they already have. You can buy advertisements that will show up in Facebook Messenger now, and you’ll see more of that over the coming years. Steve: So given that Facebook has been reducing the reach of all these pages and everything, would you be worried at this point about putting all your dollars into a platform that you don’t control? Like, what are your views on that? Ben: My thoughts are you don’t control the platform, but it’s the biggest out there by far right now. I’ve got one client that’s having me build a bot on WhatsApp for them. And it’s a really difficult system. There’s no good bot builders out there. You have to build straight on the code. So I’m hiring a developer to help with it and it’s just a gnarly process. So, with Facebook, your barrier to entry is so low and they’re still so few companies doing it. I wouldn’t allow that hesitancy to keep you out. What I would recommend though is collect the email addresses of your subscribers. I try to do that for all of my clients and that way, if Facebook Messenger does hurt your audience in some way, at least you have the email address. And maybe you could invite them to a new platform, or just start communicating with them through email if all hell breaks loose. Steve: Okay. But in terms of priority, you always go for the messenger subscriber first followed by email, right? Steve: Ben we’ve been chatting for quite a while now, I want to be respectful of your time. Where can people find more about you and your services and where you blog? Ben: So, I blog on Clear Voice most active. I have a weekly blog there where I talk about Martech. I talked about chat bots too. But in general, I talk about marketing technology, and how businesses can leverage that for their own use, so, I would recommend you follow that blog. If you want to reach out to me though, you can go to Martech.live. There’s a contact form there, or you can drop me a message on Twitter. My Twitter handle is @MartechBen, and I’m very active on Twitter at least in responding where I will respond to you. And I’m more than happy to help anyone in your audience with questions they have about chat bots. Steve: Cool. And then are you for hire as well for implementation? Ben: I am. Right now things are really busy, where if I can’t take on your project right away, I have other contractors that I can help put you in touch with, or I can point you in the right direction. But if you have something innovative or unique or new that you’re working on, or you think hasn’t been done, I’d like to talk to you because that’s really — those are the projects I like to work on and I’m prioritizing those projects right now. Steve: Cool. Well Ben, thanks a lot for coming on the show. Really appreciate you. Ben: Absolutely. Thank you, Steve for having me on the show. Steve: Hope you enjoyed that episode. I think in the last four months or so I’ve spoken to at least five different Facebook Messenger experts, and I’ve gone all out on Facebook Messenger for myself. And at some point, I’ll probably talk about my own implementations on the show. For more information about this episode, go to mywifequitherjob.com/episode217.